In my previous review I opened the article with some of my concerns toward personal privacy. I also talked about how excited I was at the Novena laptop only to be a bit disappointed when the final backwards-hinge form factor was announced. At the time I actually went as far as to use a Thinkpad X60 flashed with Libreboot as my daily laptop (and I've published a series of columns in Linux Journal if you want to do the same). Since then I've "upgraded" to a Thinkpad X200 (with a 64-bit processor!) now that it is supported by Libreboot. Basically that laptop from 2008 is the state of the art if you want to run something with a completely Free Software BIOS without a risk of weird back doors in binary blobs. While that laptop works OK for day-to-day use, when I see someone else's modern laptop with their bright high-res screens and fast processors able to run a ton of virtual machines or play high-res video it's hard to not be a bit jealous. 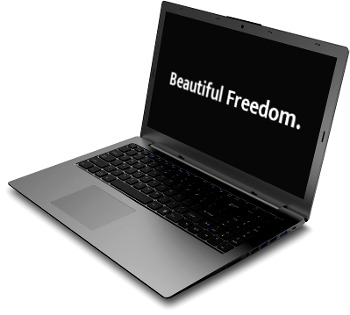 So when I see Purism announce they are building modern laptops to address the same Free Software, privacy, and security concerns, it gets my attention. 15.6” display 1920 x 1080 (a 4K display (3840 x 2160) is available). 60Hz refresh rate. In addition, the rev 2 has opted for a dark grey anodized aluminum case instead of the standard light grey aluminum, which I personally thinks looks cooler. While quite a bit of the hardware changed including the graphics card, processor, overall maximum RAM, and the option for a 4k screen, the most interesting feedback-based upgrade to me was the addition of hardware kill switches. While some laptops have physical switches that allow you to turn off the wireless card and bluetooth, these days many laptops just use a keyboard combination that shuts off the devices in software. What Purism opted for is a hardware kill switch that actually cuts the power to the wireless card and bluetooth so you can be sure it's not transmitting but they didn't stop with that. The most interesting feature is the new hardware kill switch for the webcam and microphone. With that switch off you don't have to worry about stickers over your webcam--it literally removes the power from both devices so the 99% of the time you don't use a webcam or a microphone you can leave it off and know there's no change someone with a Remote Access Trojan is listening in or watching you. According to Purism's site, the Librem 15 revision 2 will start to be available in July and a blog post a month ago stated the were in the process of testing a second prototype and would be able to being assembly immediately if it passes. As you might expect, delivery of the revision 2 will be based on when orders were placed, and even though the campaign completed, you can still order the revision 2 from the crowdfunding site. It's worth mentioning that what I'm reviewing is an early prototype and whenever you review a prototype like this you approach it differently than a finished product. Often prototypes are shipped with a number of known bugs or differences that are still being ironed out before the production product rolls around so there are some flaws that you overlook. In this case of this laptop, for instance, the case is still the raw aluminum instead of the anodized dark grey. Most of the screws were actually removed from the bottom to make it easier for me to check out the motherboard if I wanted to (picture below). The Coreboot BIOS is still being refined so this model still had the original AMT BIOS. Basically there were a number of things that you obviously wouldn't ship in a final product, and I was provided with a list of known bugs when reviewing this laptop so I'm not going to dwell on any of those things. The multi-touch driver for the touchpad mouse is still being worked on, so this model still uses a standard touchpad driver like I've always had so much difficulty with in Linux. My work laptop (a Thinkpad X240) has both a touchpad and a trackpoint mouse and I've found I always have to disable the touchpad because otherwise my palms generate clicks and mouse movement while I type. This prototype had the same behavior so I found I used the Fn-F1 key combination quite a bit to disable the mouse while I was typing heavily. Again, this is the kind of thing that is supposed to be fixed in the final model so I'm not going to dwell on it much past this. I wanted to start by talking about the overall look and feel of the laptop. It's obvious that Purism has taken some design inspiration from Macbooks with the aluminum frame and the island keyboard. Given the overall popularity of that product line among the high end laptop market I suppose I shouldn't be surprised. I defy you to go to just about any new startup in the San Francisco Bay Area or hey, go to any Linux or Open Source conference and count the Macbooks. When you are paying $1500-2000 for a laptop many people expect it to look and feel a certain way. Even Lenovo's Thinkpad line has started to slink toward Macbook design with island keyboards and dabbling with using the touchpad for the trackpoint mouse buttons (a decision they recently reversed). If you are curious about the overall size and weight of a Librem 13 beyond the official specs you can get a decent idea from a Macbook Pro. I actually put the Librem 13 side-by-side with a 13" Macbook Pro and while they of course weren't identical, the overall weight, dimensions, and sturdiness of the Librem 13 was comparable. I do think the dark grey is going to look way cooler, though. While the laptop is thin and light it still feels nice and sturdy. I figure I'll talk about the screen and the battery life at the same time because they are so closely related. The Librem 13 has a 13.3" 1920x1080 Matte IPS screen that I thought looked great. It is nice and bright and to my eyes looks better than the 1920x1080 IPS screen on my X240. Purism claims between 6 to 8 hours of battery life and I think a lot of that will depend on your screen brightness. To get an idea of battery life I used the laptop without trying to save power at all. I ran it at full brightness while browsing the web, watching some full screen videos (including testing the 1080p ogg of Big Buck Bunny a few times) and generally using the laptop as I normally would and was able to get over 4 hours with no attempt at power management. That of course doesn't touch the battery life of a modern Thinkpad X series with big batteries sticking out of the bottom, then again my current X200 can't get four hours even if I dial the brightness down. A 6-8 hour battery life is comparable for other laptops this thin and I imagine for most people 6-8 hours is long enough to take your laptop around to work in a coffee shop, a conference room, or a couch for the better part of a day without worrying about a power cord. I mentioned testing full-screen 720p and 1080p videos, which the laptop played without a hitch. I'm used to the relatively weak speakers that tend to come with Thinkpads so I was pleasantly surprised at the volume from the Librem 13 speakers. Speaking of sound, I've gotten some questions about how quiet the laptop is. 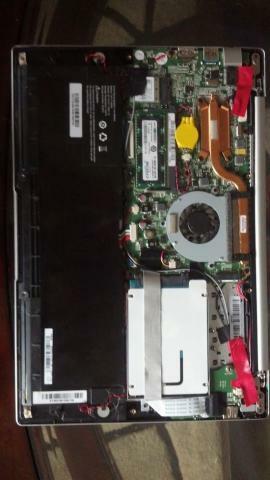 The laptop does have a fan and features vent holes along the bottom. It's kicked on while I've typed with it on my lap and while you can hear it a bit in a quiet room, to my ears it's pretty quiet. Let's put it this way, you can't hear it over my typing and certainly not if you were using the speakers at all. This is as good a segue as any to bring up the keyboard which to me is one of the most important parts of a laptop. It's not fair to compare any laptop keyboard to a Model M so instead I'll compare it this keyboard to the other two laptops I use most frequently: a Thinkpad X200 and a Thinkpad X240. The X200 uses a more classic Thinkpad-style keyboard but honestly I think that Thinkpad keyboards hit their peak around the X60 line and have started a steady decline. The X240 and Librem 13 have a more modern "island keyboard" design like you see in Macbooks and a number of other modern laptops. I sat all three laptops side by side and compared each. It's a bit tricky to compare keyboards between the X200 and the two island keyboards but I definitely preferred the Librem 13 to the X240. When it came to the X200 and the Librem 13 I think it's more of a tie. I like the extra key travel of the X200 but the Librem 13 keyboard actually felt a bit crisper, especially when typing heavily with more force. This is a very important feature for anyone who cares about privacy. Instead of fumbling around with stickers, you can just leave this switch off 99% of the time and only turn it on when you truly need the webcam or microphone. The rest of the time you can be assured that even if someone were to compromise your laptop, they wouldn't be able to record you over the webcam or microphone. One final point about the wireless I noticed is that the antenna didn't seem to be as strong as on a Thinkpad, but then I've always found Thinkpads to have the best wireless connectivity so that wasn't too surprising. The software side of the Librem 13 is very similar to the Librem 15 so for the full story I recommend you check out that review. It uses "PureOS" which is the Free-Software approved Trisquel distribution with some Purism-specific add-ons. The add-ons are mostly focused on privacy and security and include Tor and a packaged version of the Tor Browser Bundle which is not only installed by default but had an icon on the desktop. Even the default browser is a modified version of Firefox that includes the two privacy-enhancing plugins HTTPS-anywhere and Privacy Badger. The rest of the desktop is a fairly typical Gnome 3 desktop so I won't spend much time on that and I figure most people will end up installing their preferred desktop environment. Out of the box Purism ships the machine with home directory encryption enabled. Due to the fact that full-disk encryption typically gets set up at OS install time, Purism has opted for now to stick with home directory encryption which is a lot simpler for the end-user to set up when they get the laptop. Honestly most of the sensitive files a user would want to be encrypted end up in the home directory anyway, but down the road it would be interesting to see if they can come up with a way to enable full disk encryption as well (as I imagine otherwise a number of their customers will end up doing a distribution reinstall to enable it). All of the software on the laptop is selected based on being Free Software. Both of the ethernet card and the wireless adapter use completely Free Software drivers, the OS has no proprietary software (and indeed doesn't even include a non-free repo like with Debian). The Coreboot BIOS is also Free Software but there is still one remaining piece of proprietary software like on the Librem 15: the Intel Firmware Support Package or FSP. This binary blob is loaded into the coreboot BIOS and is used to initialize Intel silicon. Purism is working to open up this code as well and has at least been granted the ability to run unsigned code in the BIOS instead of the traditional signed BIOS binary requirement. This means that once a Free Software replacement for the FSP has been written it can be loaded. This is similar to the issues with the Intel Management Engine on the X200. 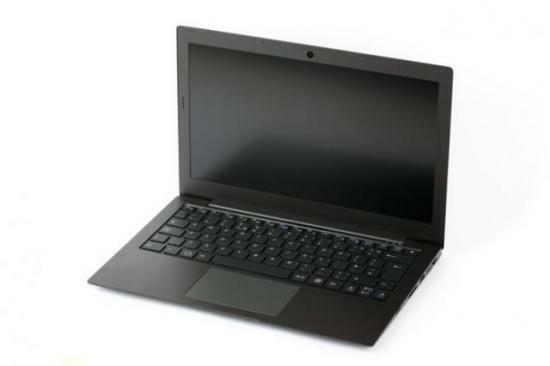 The Libreboot project worked around that by reverse engineering their own Free Software ME replacement so that the X200 and similar Thinkpads could join the Libreboot hardware compatibility list. Hopefully Purism will be able to pull off something similar in the future. I want one. Maybe I've just spent too long on older hardware but it's nice to be able to use a laptop with modern specs without having to compromise on my Open Source and privacy ideals. The Librem 15 was definitely too big for me but while the Librem 13 is bigger than most of my personal laptops, it's about the same size as a modern Thinkpad X series (but thinner and lighter). I'm more than willing to add an inch or so to the width in exchange for such a nice, large, high-res screen. Even though my X200 is technically smaller, it's definitely heavier and just feels clunkier. I thought the biggest concern I'd have would be the keyboard but when I compared it to my X200 it was basically a tie. Honestly the biggest issue for me personally is the touchpad mouse. I'm just a trackpoint person, I can't help it. That said, at my day job I have a buckling spring keyboard with a trackpoint in the middle of it, but since my home setup uses a classic Model M I've sort of been trained to not reach for it and reach for the physical mouse instead (and for the most part I just stick to the keyboard and keyboard bindings anyway). If Purism can fix the issue with palm presses generating mouse events while typing (which the multi-touch driver is supposed to solve), I think the mouse will be fine. If you are also interested in a Librem 13, it looks like their crowdfunding campaign has a little less than a month left to go with the first units shipping in September. Like with most crowdfunding campaigns there are different tiers of pricing to reward "early birds" and while the $1649 base price tag isn't cheap, you can get a $200 discount in that early bird tier. In either case while it's certainly not as cheap as random hardware you can get at an electronics store, it's higher quality hardware and comparable to the prices of other higher-end laptops like Macbook Pros and vendors that ship supported laptops with Linux pre-installed, especially when you consider Purism obviously has smaller scale and is creating a specialized product for a particular audience.